Ariel Reversible Sport Top Conch Ruby. Print: Conch, Color: Ruby, reverses to Solid Red. 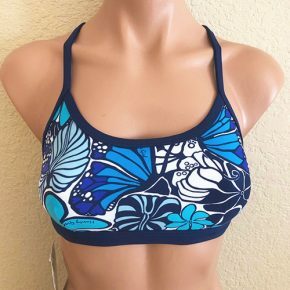 Full coverage scoop neck sport top, Pull-Over style, adjustable hook straps that can be worn crossed, and also have adjustment to make straps shorter. Lightly padded cups (padding sewn to an inner lining so it won’t scrunch up).